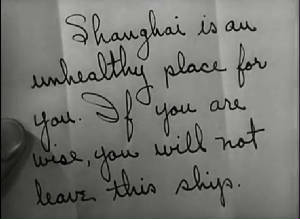 Before Charlie Chan leaves his boat upon arriving in Shanghai for his first visit in years, supposedly a vacation, a man stuffs a note in his pocket warning him not to leave the ship. At the docks, Chan is greeted by Philip Nash, Sir Stanley Woodland's secretary, and by Diana Woodland, Sir Stanley's niece. He is surprised by his son Lee, who was sent by his firm to look into the trade situation there. At a banquet that evening that is being given in Chan's honor, Sir Stanley opens a box that supposedly contains a special scroll for the detective. Suddenly, Sir Stanley is shot dead by a gun that had been rigged inside of the box. The box, whose intended victim was Charlie Chan, had been in Nash's possession all day, and when questioned about this, he stated that he had had no reason to check the box's contents. Later that night, a man peers into the window of Chan's hotel room, and, with a silencer on his gun, shoots the figure in Chan's bed and flees. Lee, thinking that his Pop has been shot, runs into the room. Moments later, Charlie Chan calmly walks into the room. He shows an amazed and relieved Lee how he had placed pillows under the covers to give the appearance of his sleeping form. The next day, when Chan calls for room service, the switchboard operator telephones Ivan Marloff letting him hear for himself that the detective is still alive. Chan then visits Diana, and after giving his condolences, learns that during the previous evening, someone had broken into her father's library and had searched through his papers. Back at the hotel, Chan is met by a man identifying himself as the chauffeur of Colonel Watkins, the chief of police. 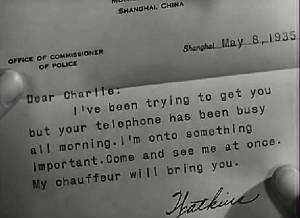 He hands the detective a note instructing Chan to accompany the chauffeur. After Chan leaves, Lee receives a telephone call from Colonel Watkins who says that he has not sent for Chan. 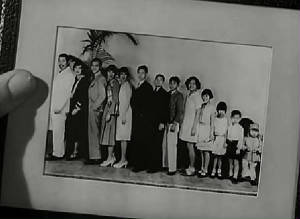 Realizing the ruse, Lee tries to follow his father, but he is subdued by the driver of his taxi and is taken to the same house where Chan is being interrogated by Marloff, who is hidden in darkness. Chan and Lee trick the gang into believing that the police have followed them to the house. Through quick thinking and Lee's vigorous fisticuffs, the father and son manage to escape. Later, Chan visits James Andrews, a special agent from Washington, D.C., and they discuss Sir Stanley, who was a secret agent of the British government, and who had been cooperating with the opium committee of the League of Nations as well as with officials of the Chinese government to round up a gang of opium smugglers who operate out of Shanghai. While the two talk, Nash, now Andrews' secretary, searches through his belongings in another room. As Chan and Andrews continue their conversation, Chan glances at a mirror and notices a gun pointing through the door. Chan ducks just as the gun is fired and slams the door shut, thus trapping the weapon in the doorjamb. Nash's thumbprint is found on the gun, and he is arrested. 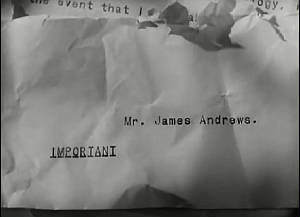 Before he leaves, Chan secures a supposedly innocuous letter from Sir Stanley to Andrews that had been marked "important." Heating the letter back at his hotel room, Chan discovers a hidden message that states that Sir Stanley had made an important discovery concerning Ivan Marloff. Chan thinks it odd and suspicious that earlier Andrews did not feel that the letter held any real importance. 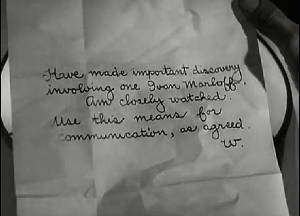 However, Andrews arrives at Chan's room and, holding a cigarette lighter under the letter, reads the secret message. Chan then goes with Andrews to search the house where he and Lee had been held. While there, Chan discovers a ink stamp pad in the fireplace. They then go to police headquarters where Diana arrives to see Nash. While she visits with him, she slips him a gun and they both escape. Returning to his room, Chan finds that Lee has trailed the taxi driver who had earlier abducted him to a waterfront bar called the Verailles Café. Andrews calls Chan, stating that he has captured a member of the gang and has cracked the case. When Chan arrives at Andrews' room, he sees Andrews beat a confession out of chauffeur that Marloff is at the Versailles Café. 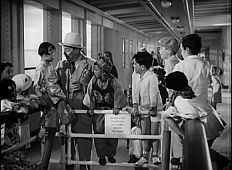 Andrews and Chan leave for the café, where, meanwhile, the fugitive Nash asks Marloff to put him on a boat for America. 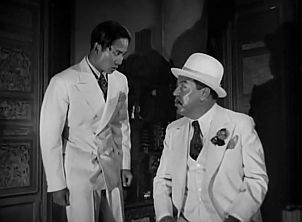 Calling Nash's escape from jail a trick that was arranged by Charlie Chan, Marloff hits Nash, knocking him out, and tells his men to drop him overboard once the ship is out at sea. Upstairs, Chan and Andrews follow the taxi driver into a room where the gang waits, hidden below a trap door. Searching through some boxes, Chan discovers that the wine bottles contain opium. Finding the trap door, Andrews suggests that Chan go below and signal authorities to run the boat to the government dock. Chan, feigning a faulty flashlight, delays his descent until the police, whom Lee has called, arrive and capture the gang after a shootout. Chan reveals that it was Andrews' valet who had attempted to shoot Chan earlier and that Nash's thumbprint was put on the gun with a stamp pad because the gang had felt that he knew too much about Sir Stanley's investigation. Andrews offers to remove the gang members to the government's boat, but Chan pulls a gun and accuses him of being the real leader of the gang. 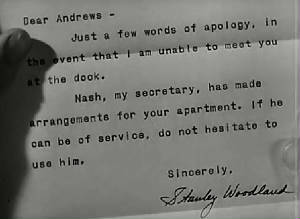 Nash had discovered through Sir Stanley's correspondence that the real Andrews neither smoked nor drank, yet the man posing as Andrews had earlier accepted Chan's offer of scotch and soda and cigarettes. "You pretend to be G-man," says the detective, "now turn out to be N.G.-man." Lee arrives with a wire photo of Andrews, who was killed three weeks earlier in San Francisco. Chan then sends Nash to comfort Diana. Although he was earlier annoyed that his son was always tying up the telephone talking with a girl, Chan allows his son one phone call to his female friend, to which Lee, imitating his father, says, "Thank you so much." NOTE: Although the character played by Frederik Vogeding is listed as "Burke" in the onscreen credits, he is called "Ivan Marloff" throughout the dialog of the film. Sixty summers young, sixty winters old...brrr. Idea of making speech bring goose pimples. Holiday mood like fickle girl - privileged to change mind. Old excuse, like ancient billy goat, has whiskers. Two ears for every tongue. Motive, like end of string, tied in many knots; end may be in sight, but hard to unravel. Only one enemy necessary to commit murder. Silence best answer when uncertain. Distance no hindrance to fond thoughts. Insignificant man has never improved on nature's tonic. Cold omelet, like fish out of sea, does not improve with age. If answer known, question seem unnecessary. Hasty conclusion like hind leg of mule - kick backward. Beauty of poppy conceal sting of death. Spider does not spin web for single fly. Owner of face cannot always see nose. Shot in dark sometime find eye of bull. Soothing drink, like summer shower, bring grateful relief. Smart rats know when to leave ship. Only foolish dog pursue flying bird. Innocent man does not run away. Appearances sometimes deceiving, like wolf in lamb's clothing. No one knows less about servants than their master. (Lee: "How do you do it, Pop, with mirrors?") Good for seeing backwards. (Lee: "...is there something fishy about it?" [Regarding a note sent to Chan supposedly from Shanghai Police headquarters]) Slight odor, perhaps. (Marloff: "Just a taste of your own medicine.") Medicine very bitter. (Andrews: "One man cannot move a mountain, you know.") But two men can start digging. Vowed a princess fair to save? Charlie Chan is in Shanghai this time. Strange that the Chinese detective has never been set there before, but that oversight is patched up very nicely in this film. It's right in line with the eight previous Chan pictures and should follow along in its okay b.o. [box office] footsteps. Warner Oland, the merry Swede who has won himself an international rep as a Chinaman, still handles the Chan assignment with competence and ease. This time he's after a gang of dope smugglers in China. Keye Luka [sic] is cast as his son and gets in some nice laughs. Charles Locher is the juve and seems to promise screen growth. Other parts are mostly type cast. After Earl Derr Biggers died last year Fox seemed to be faced with the possible loss of the Chan stories as future screen fodder. They haven't at all. By assigning others to carry the character on, they've got themselves a steady stream of popular material. Gerard Fairlie and Edward T. Lowe did a fine job on the current episode and Charlie's future still looks good. ACCORDING TO THE MISSIONARY WHO MET CHARLIE CHAN ON THE SHIP TO SHANGHAI, THE LOCATION OF THE MISSION HE WAS CONDUCTING: "...in the Yang Tze Valley." THE WORDS ON THE LIFE PRESERVER OF THE SMALL BOAT CARRYING THE REPORTERS AND CHARLIE CHAN: "Victoria - Shanghai"
CHARLIE CHAN'S OLD FRIEND: Colonel Watkins (Colonel Watkins: "I count myself lucky to have known Charlie Chan for quite a few years.") Colonel Watkins knew Charlie Chan from the time he (Watkins) worked at Scotland Yard "at the time of Sir Lionel Bashford's murder." "Distance no hindrance to fond thoughts." CHARLIE CHAN'S BREAKFAST ORDER: "Will have coffee, rolls, marmalade, and very large omelet - Foo Yung." THE BRAND NAME ON BURNED STAMP PAD: "Excelsior Inking Stamp PAD"
THE "ORDERS" GIVEN BY CHARLIE CHAN TO SON LEE: "Return to hotel. Burn disguise. Study detective book. Watch telephone...and take bath." CHARLIE CHAN'S DESCRIPTION OF THE SWITCHBOARD GIRL AT HIS HOTEL: "Very pretty brunette." THE DIALOGUE OF JAMES ANDREWS ON THE TELEPHONE: "53 reporting on secret assignment file 457-M..."
THE ORDER PLACED BY THE KIDNAP TAXI DRIVER AT THE VERSAILLES CAFE: "A bottle of whiskey - and two glasses." MURDERED IN SAN FRANCISCO THREE WEEKS AGO. bawl out - (Informal) To scold vociferously; reprimand or scold vigorously. Lee Chan: "...before you bawl me out, Pop..."
cagey - Wary of being trapped or deceived; shrewd; marked by cleverness. Second Hotel Switchboard Operator: "The old boy's pretty cagey, he's checking up on us"
foo yung (egg foo yung or egg fu yung) - A Chinese omelet containing onions and celery and chopped meat or fish. 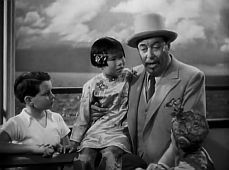 Charlie Chan: "Will have coffee, rolls, marmalade, and very large omelet - foo yung." James Andrews: "I'll join you at noon for a Gin Rickey." Charlie Chan: "You pretend to be G-man, now turn out to be N.G.-man." James Andrews: "...the Opium Committee of the League of Nations..."
Lee Chan: "Tell these mugs to lay off me..."
N.G. - (Abbrevriation) No good. phooey - (Interjection; origin: circa 1925-30) Used to express disgust, disbelief, or contempt. Lee Chan: "Yeah, it's a pip, too." James Andrews: "...see if I can get rid of these sea legs." Missionary: "...in the Yang Tze Valley."